Granada Material Handling Ltd was established in 1980 by two Directors who, having gained a wealth of experience within the lifting equipment industry, wanted to create a company that could offer bespoke and tailor‐made solutions for unusual lifting applications. Granada’s willingness to investigate various technologies and develop ideas into products encouraged many blue chip companies to contract Granada to solve their lifting problems. This resulted in Granada installing specialist systems throughout the Automotive, Aerospace and MOD sectors among many others. Working for this type of client has ensured rapid development in quality systems, training and health and safety. The company swiftly grew and the appreciation for service and repair expertise to compliment the design and build ethos of the company was realised in 1996 with the formation of a specialised nationwide service division through its Granada Cranes & Handling business. This service division, run from our central UK location, has embraced changing people’s approach to lifting equipment service by understanding and implementing potential service solutions. With investment and development in training, health and safety systems, how reports are provided and equipment evaluation systems, Granada continue to lead the way in service provision. Granada Cranes | The company today. At Granada Cranes & Handling we are fortunate to be able to call on a wealth of experience within our organisation. This knowledge runs from our senior level Directors right through our management team and senior technicians. This experience is complemented by the recruiting of young people with an attitude of willingness to learn and our development of them through on the job and education based training. 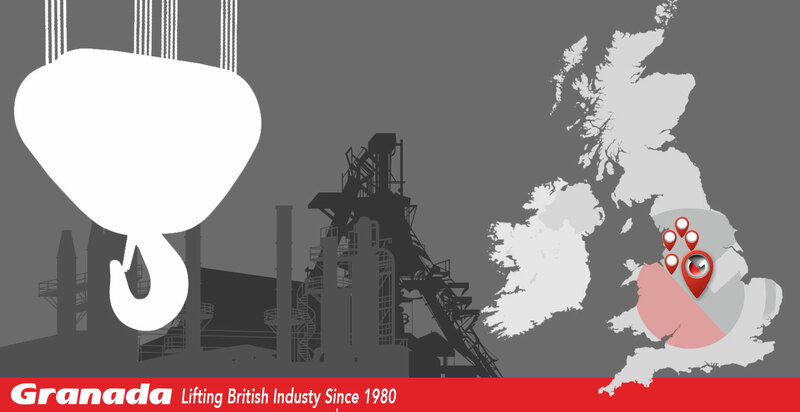 Granada Material Handling Ltd has continued to grow and as a company now employ over 80 full time staff nationwide from several UK locations. Our manufacturing and service facility in the heart of the West Midlands gives us a great central UK location right in the heart of the M5, M6 and M42/M40 motorway networks. We also have our registered head office and service base in Lancashire, a service facility at Airbus Operations in North Wales, an offshore service team at Wirral and Mostyn Dock and an onshore service team at Clitheroe, Lancashire. We believe it is essential to give all our customers the confidence that we have the know how to safely and competently maintain their equipment while ensuring our longevity. As a business we are fortunate to be both manufacturers and maintainers of lifting equipment, therefore we are constantly learning of ways to improve our cranes designs. As manufacturers of overhead cranes we are regularly building new cranes with spans of 5 metres up to 26 metres and capacities of 125Kg up to 32 tonnes from our workshop facilities in the West Midlands. We have also previously acquired temporary premises to complete the manufacture of larger projects and have hands on experience building over 27 metre span 70 tonne cranes. 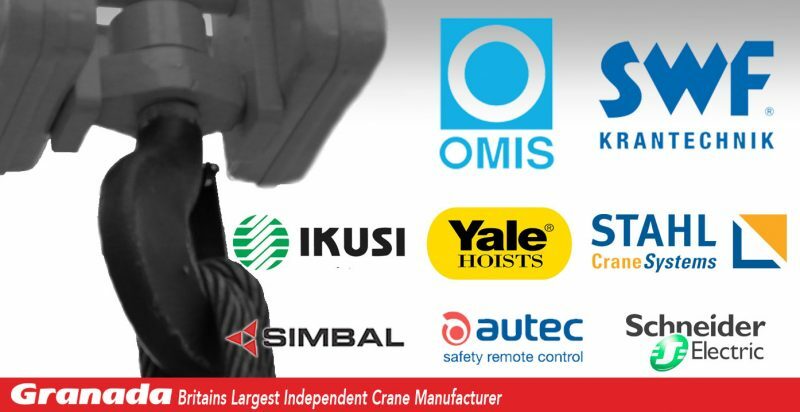 As the UK’s largest independent crane manufacturer we have a range of suppliers with whom we have built established relationships. We are not tied to a single brand of equipment and will always ensure that we offer the most suitable and economical solution for your specific application, an indication of this can be found through the diverse range of products explained within our site. As well as supplying equipment from multiple manufacturers we are also able to obtain spares and competently service and repair all makes and models of overhead cranes and lifting equipment. Where parts for older items are no longer available from stock we can often source alternatives or manufacture replacements through our outsourcing design/build service. At Granada Cranes & Handling we operate under the ethos of providing our customers with a comprehensive single source solution for all our clients overhead crane and lifting equipment requirements, we believe is offering the personal service and interaction you would expect from a small business with the support and capabilities of a multinational, we believe in offering a value for money service with competitive pricing that does not compromise on quality and above all else an unequivocal importance and adherence to safety, we will not compromise on the safety of our workforce or yours and work to the policy that if a job cannot be done safely it will not be done.